Made by Tornaghi, Angelo in Sydney, New South Wales, Australia, 1860-1900. Tornaghi was born Milan in 1831 and arrived in Sydney in 1858 to supervise the adjustment of the Negretti & Zambra instruments ordered by Sydney Observatory. Two glass cylinder that are graduated at the base. 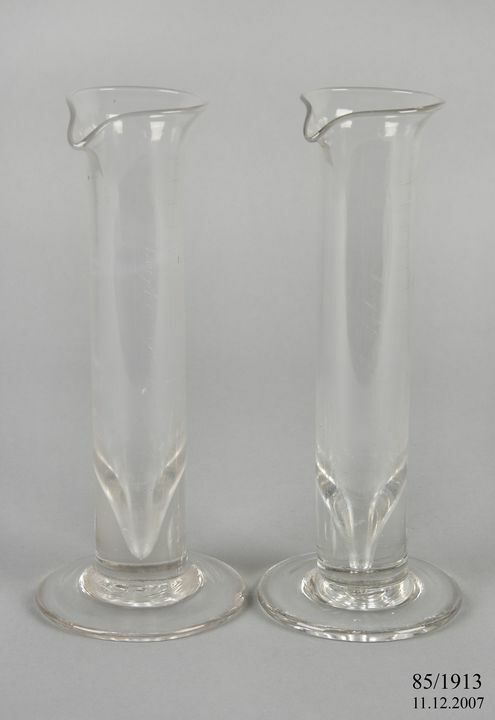 Both cylinders sit on a circular glass foot and have a lipped spout on one side of the opening at the top of the cylinder. Scale divisions in hundredths of an inch from 0-15 have been engraved on the surface of the cylinder. Tornaghi was born Milan in 1824 and arrived in Sydney in 1858 to supervise the adjustment of the Negretti & Zambra instruments ordered by Sydney Observatory. By 1861 he had set up his own business at 28 Bridge Street Sydney and was acting as a local agent for the London based Negretti & Zambra. It was during this period that Tornaghi also started making instruments himself and by 1864 he had moved to larger premises at 312 George St Sydney. His first major scientific achievement in the colony was the invention in 1863 of a portable and accurate circumferentor. These were used by surveyors in place of the ordinary theodolite and were used to measure horizontal and vertical angles. Tornaghi must have impressed staff at Sydney Observatory for he was one of the members selected by H.C. Russell to work with him on the observations of the 1874 Transit of Venus. The 1889 publication Men of Mark stated that for "the Sydney Observatory he has also constructed numbers of tide-gauges, standard barometers, self-registering barometers, micrometer eye-pieces, and numberless other instruments of importance." However it was as a clock maker that Tornaghi is primarily remembered as he took on many government commissions including constructing and looking after "clocks in the Government offices and in various ministerial departments, which alone keeps a large staff of men employed." On one of his biggest projects the construction of the Sydney Town Hall Tornaghi declared he would forgo all payment if the clock did not turn out. As it turned out he may have been wiser not to make this offer for his design to construct what was then the largest clock in Australia was rejected by the government. The clock is believed to have been installed in the Lismore Post Office. Other Post Office clocks by Tornaghi can be found in Albury, Kiama, Orange, Forbes, Maitland, Tamworth, Yass, Dubbo, Grafton and Goulburn. Tornaghi was also a designer and metal worker and amongst his many accomplishments were the largest known electro-metallurgy plated statues. These monuments were14 feet high and were placed in front of the Mutual Fire Assurance Company building. The rain gauges were used at Sydney Observatory, Watson Road, Observatory Hill, Sydney, New South Wales, Australia.